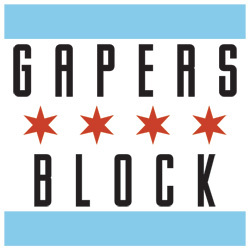 There was no Bulls theme song playing over the loud speakers when Kurt Vile & the Violators took the stage at Lincoln Hall on Tuesday--but there might as well have been. 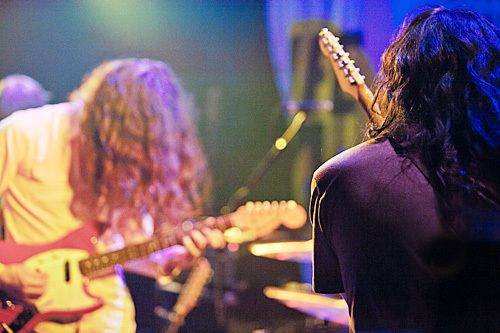 Vile and his crew emerged from backstage looking very much like a team as they proceeded to stomp through songs from their new album, Wakin' On a Pretty Daze, with fierce discipline, emotion, and an added heft. Hell, even some of band members looked a little bit like Joakim Noah. 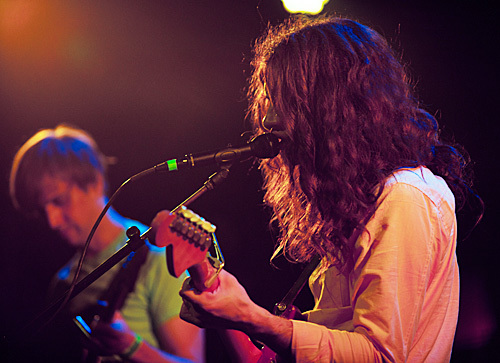 Wakin' On a Pretty Daze reiterates many of the introspective themes already explored on Kurt Vile's previous albums. 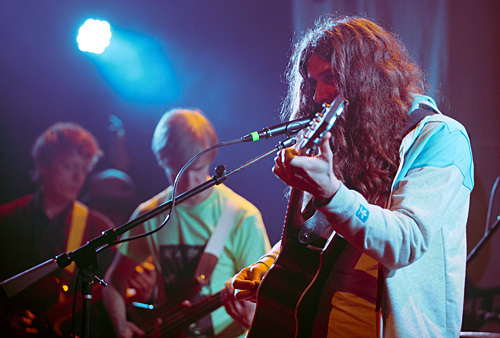 On 2011's Smoke Ring for My Halo, for instance, Vile would riff about making "the most outta your chill time, maaan" and figuratively taking a "whiz on the world" in a lazy-man drawl that somehow came across as contemplative when paired with the psychedelic space it was allowed float in musically. Pretty Daze fine tunes this effect with a more lyrically articulate delivery of his laid-back worldview and even more room to breathe and shift through long, expansive musical landscapes. 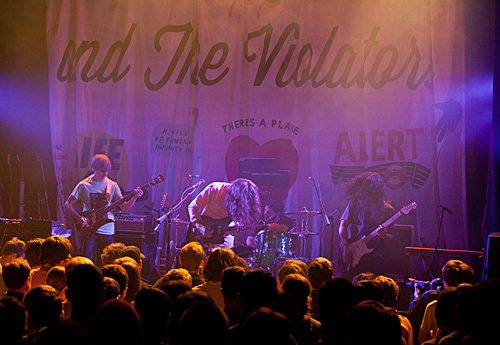 But at Lincoln Hall, the Violators stomped through the album's songs with yelps, screams, a lot more fuzz, and a showy confidence that led to heightened jams and crescendos. 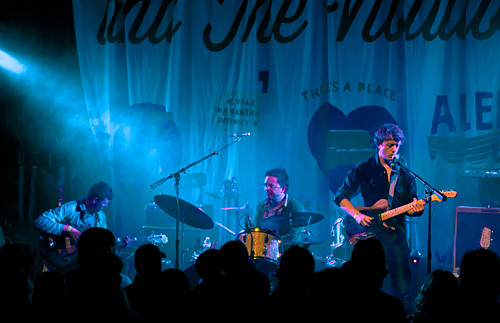 The band played in front of a giant backdrop of icons from its Philadelphia mural that makes up Wakin' On a Pretty Daze's cover image. And for most of the set, Vile and the Violators played at a rapid pace that magnified the band's visible comfort and showiness on stage. 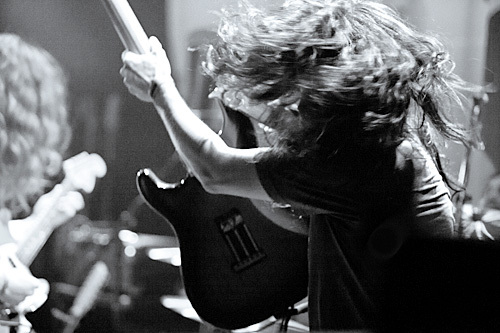 Vile himself contributed an extra oomph to a lot of his songs with big, J. Mascis-style guitar soloing. On "Girl Called Alex", the band pulled of a radical shift of the song's walking chord progression into its breezy, hypnotic outro. Many band members also took on multi-instrumentalist duties, whether tinkering on a wurlitzer organ during the jammy "Shame Chamber", or squawking on an alto-saxophone during "Freak Train". Songs from Smoke Ring for My Halo also felt more sure footed and confident. "Jesus Fever" had a newfound punchiness, while "Ghost Town's" slow, towering chords crescendoed into a frenzied shoegazing finish that saw guitarist Jessie Trbovich violently swinging his guitar to produce feedback. The Violators appropriately closed the regular set with "Hunchback" and "Freak Train", two noisy tracks from 2009's Childish Prodigy. But instead of "singing" the verses of bizarre characters on "Freak Train", Vile took advantage of the song's implicit freakiness to mostly yell, scream, and otherwise focus on leading his band into one of the most brutally noisy finishes Lincoln Hall may have ever heard--at least since Metz played the venue that previous weekend. There was a short break in the pace during the latter half of the set for Vile to take some acoustic numbers. He sang the winking chorus of "Peeping Tomboy" in that exaggerated, lazy-man drawl now so much a part of his songwriting persona. 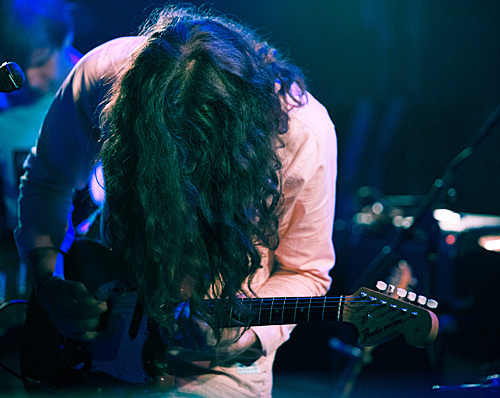 But it was clear on Tuesday that while Vile's music evokes a serene state of mind, Kurt Vile & the Violators are a lot rowdier as an entity on stage. 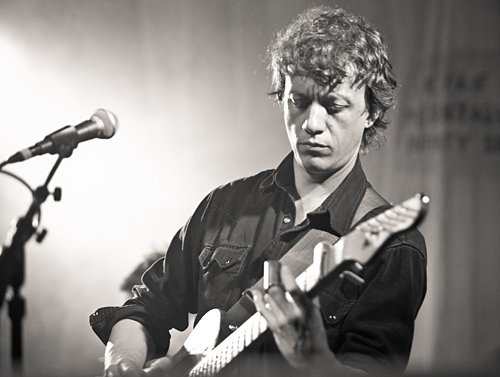 Opener Steve Gunn, from New York, provided an appropriate warm-up for the headlining set. He and his band played a versatile set featuring mostly long, finger-picked songs ranging anywhere from blues to breezy, Bert Jansch-style folk rock.